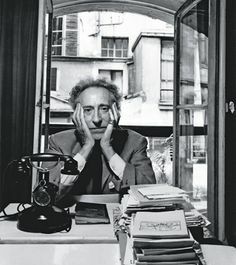 And yet, “the real man of genius,” for Cocteau, is the poet, and he hopes for us that the genius of poetry “hasn’t become something like a shameful and contagious sickness against which you wish to be immunized.” He has very much more of interest to communicate, about his own time, and his hopes for ours. Cocteau recorded this transmission from the past in August of 1963. On October 11 of that same year, he died of a heart attack, supposedly shocked to death by news of his friend Edith Piaf’s death that same day in the same manner. His final film, and final communication to a public yet to be born, accords with one of the great themes of his life’s work—“the tug of war between the old and the new and the paradoxical disparities that surface because of that tension.” Should we attend to his messages to our time, we may find that he anticipated many of our 21st century dilemmas between technology and humanity, and between history and myth. It’s interesting to imagine how we might describe our own age to a later generation, and, like Cocteau, what we might hope for them. This entry was posted in film, history, philosophy, politics, uncanny and tagged edith piaf, jean cocteau, time. Bookmark the permalink.